A heavy explosion in Afghanistan capital Kabul has claimed the lives of at least 65 people and left 325 wounded so far, local media reports said. Tolo News quoted a spokesman of the Ministry of Public Health as confirming this news. The death and injury toll is expected to go up, the reports further stated. The massive explosion occurred in the diplomatic enclave of Kabul on 31 may's morning. 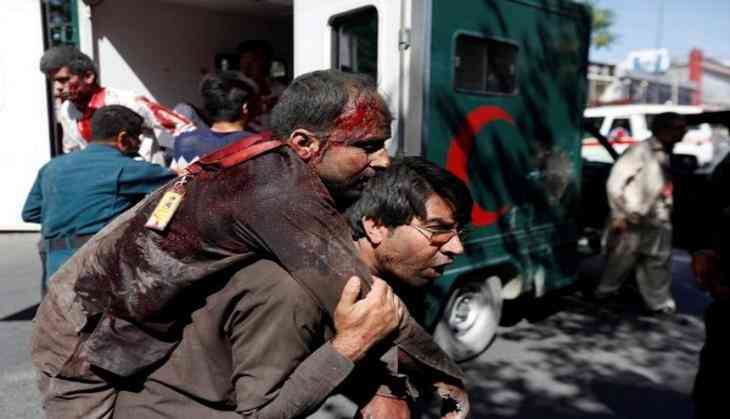 Tolo News quoted sources at the Wazir Akbar Khan Hospital, as saying earlier that between two and nine persons had died and over 90 had been wounded in the blast. The Al Jazeera web site, quoting officials, reported that it was a suicide car bomb attack, described as "one of the biggest" to have hit the Afghan capital. Khamma Press quoted Ministry of Interior spokesman Najib Danish, as confirming that the incident had taken place close to Zanbaq Square in the city's 10th police district. He was further quoted, as saying that a suicide bomber had detonated a vehicle packed with explosives in the area. The Ministry of Public Health officials were quoted, as saying earlier that more than 60 people in wounded condition had been shifted to various hospitals. The Khamma Press said that no group, including the Taliban has claimed responsibility for the incident so far. Earlier, India's External Affairs Minister Sushma Swaraj said all staff at the Indian Embassy were safe and not affected by the huge blast in Kabul's diplomatic enclave. "By God's grace, Indian Embassy staff are safe in the massive # Kabul blast," Swaraj said in a tweet. India's Ambassador to Afghanistan Manpreet Vohra told ANI, "Massive VBIED (Vehicle-borne improvised explosive device) not too far from our Embassy. Buildings, including ours, suffered considerable breakages, but all our staff are safe." The blast is said to have occurred about three kilometers from the Indian Embassy, said reports.